The Mega Millions jackpot is now the third highest in the game's history at $548 million, and Powerball is not far behind at $314 million. LITTLE ROCK, Ark. 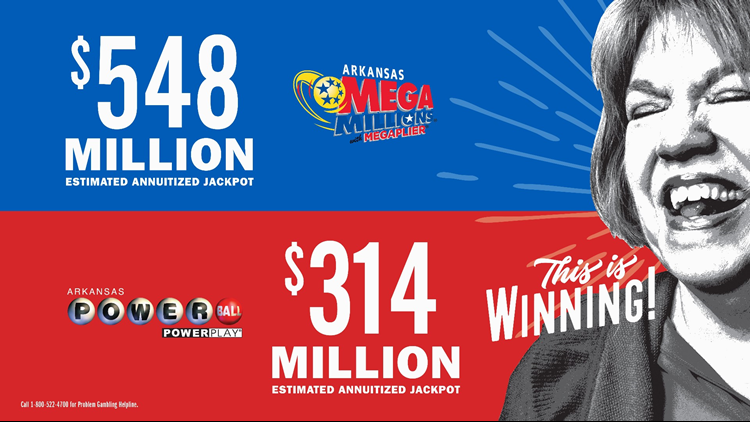 – Arkansans have a chance at winning nearly $1 billion with Mega Millions and Powerball jackpots from the Arkansas Scholarship Lottery this weekend. The Mega Millions jackpot is now the third highest in the game’s history at $548 million, and Powerball is not far behind at $314 million. Since January 2018 alone, Arkansas lottery players have won more than $3.6 million in Powerball prizes and more than $1.8 million in Mega Millions prizes. Beginning with the Lottery’s inception in 2009, there have been 12 Powerball® millionaires and five Mega Millions millionaires who purchased their winning tickets in Arkansas, including a $177 million winning Mega Millions ticket sold in Stuttgart last year. Woosley says playing these draw games is easier than you might think. The next Mega Millions drawing is Friday, October 12 at 10 p.m. and Powerball is Saturday, October 13 at 9:59 p.m. Visit MyArkansasLottery.com for winning numbers and to locate a Lottery retailer near you.